The patio of the one-floor ranch house was packed. Smoke drifted from the grill and everyone seemed to have a red Solo cup in his or her hand. Were it not for the babel of languages and high walls topped with barbwire, it could have been a weekend BBQ anywhere in the world. But this was Kabul, and the voices were those of aid workers, security contractors and journalists. They only died down when one of the guests began talking about hitchhiking to Khost. A heated debate erupted between the Dutch tourist who uttered the remark and an aid worker who basically called the traveler crazy. With a mix of anger and shock in his voice, the aid worker tried to explain that Khost  in the heartland of the dreaded Haqqani network, the group that carried out the recent wave of coordinated attacks in Kabul  is a war zone and not somewhere to wander around with no plan. "They'll shoot you," he said. To which the Dutch traveler replied, "Why would [the Taliban] waste a bullet on me?" The Dutchman had gone to Afghanistan through couchsurfing.org, social media's answer to corporate travel sites. If you do not see yourself as a tourist, want to live like a local for a while or simply do not have the cash for a hotel, then couch surfing is the way to go. The website puts a face on a place by allowing travelers and hosts to set up profiles and swap messages about travel arrangements. Visiting Moscow and looking to meet up with a local for a cappuccino and a chat? Hitting up Rio for Mardi Gras and need a free place to crash? These are the normal exchanges  and they usually result in staying at a person's house. But when it comes to couch surfing in Afghanistan, "usual" is out the window. The question is: Who would want to live like a local when local is Afghanistan? Of the more than 4 million "couch surfers" on the site representing 251 countries and territories and 366 languages, the answer is, at the moment, around 381. That is the number of people who are members of the Afghanistan group on the Couch Surfing site. 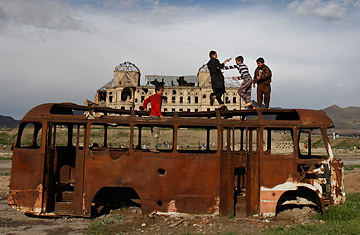 As the website continues to grow, it has expanded into stranger and stranger travel destinations: Afghanistan has become one of these, representing what could be described as extreme couch surfing, with tourists with no experience of combat zones staying with hosts whose profiles are as likely to feature "armed guards" or "razor wire" (apart from the more usual caveats of "no dogs" or "foldout couch"). Of those 381, few will actually make it  for good reason. "I'm on the Afghanistan couch-surfing forum because I was thinking of going to Afghanistan this summer, but due to recent events, it doesn't seem like a good idea for a solo white woman to go now," says Elisabet Sole, a Spanish member. But some still go  drawn by the beauty of the Hindu Kush mountains, the destroyed Buddhas of Bamiyan, natural wonders like the Band-e Amir lakes and the remote Wakhan Corridor. Others are drawn by quasi-philosophical cravings, want to find the truth behind the news, are attracted to the danger or simply want to prove their own courage. Still, couch surfing in Afghanistan cannot be considered a 2.0 version of the hippie trail of the 1960s and '70s. Today, fighting has dragged much of the country's population to the depths of poverty and despair. A U.N. report released in February said that 3,021 civilians were killed in 2011, representing an 8% increase from '10. This is the fifth consecutive year that the number of deaths has increased. The country is routinely ranked as one of the most dangerous in the world for violent death. The past months have not been kind: a bombing in December left scores dead at a religious ceremony in central Kabul, and the burning of Korans and the massacre of civilians in Kandahar has strained relations between Westerners and locals to the breaking point. Years ago, the first time this correspondent looked at the Afghanistan Lonely Planet guide's "When to Go" section, the advice was blunt: "Never." Today, that's changed little. The latest edition's section on "Getting In" to Afghanistan from Pakistan advises: "Before leaving Peshawar you must go to the Khyber Political Agent [Stadium Road] to collect your gunman. Without him you'll be turned back at the first checkpoint. There's plenty to see as you drive through the Khyber." Though a tourist brochure that featured words like firefight, land mine, bad roads, poverty, kidnapping and insurgency would deter your average traveler, the couch surfers who do make it are not your average travelers. They are the ones that have Libya, Uzbekistan, Iraq, Syria, North Korea and Colombia listed as places they want to go to next on their Couch Surfing profile pages. "My first day in Kabul was September 13 [of 2011]. I was walking past Massoud Circle, around the corner and east of the U.S. embassy, when an Afghan man came up to me and said something that sounded urgent, but that I didn't understand," says a couch surfer from Alaska, who did not want to give his name because he did not want his family to know he had gone to Afghanistan. "Moments later I heard a small blast, followed by a huge explosion and then automatic gunfire as militants began an attack on the embassy and other targets in Wazir [Akbar Khan, a heavily fortified neighborhood of Western embassies and NATO bases]. I had to run for cover. If I had walked a few minutes more in the direction I was going, I would have been in a world of trouble," he tells TIME. "I was petrified, mostly about the idea of abduction. After getting caught up in the attack in Kabul, in what was supposed to be one of the most secure areas of the country, I worried more about getting injured or killed." But, he adds, "Kabul was Kabul  how could a tourist not be fascinated by the real thing? It's like the anti-Paris of tourism." Most, however, have more prosaic experiences. "I wanted to talk to people and hang out with them, get a sense of what it's like to be an Afghan," Tashi Bucinel, a European couch surfer, tells TIME. "I was scared the first couple of days. I wasn't sure what to expect and I didn't know how trustworthy the people are, so I was very apprehensive." On her first morning in Kabul, she decided to walk to meet the Dutch couch surfer. "When I was walking down the street, I was looking at the people around me and my heart was beating fast. I thought of the warnings I'd heard before like, 'Don't walk, take a taxi' or 'You never know who is a potential suicide bomber,' and regretted not taking a taxi. I saw every bearded man in a shalwar kameez [men's traditional clothing] as a suicide attacker and was just waiting to hear a bomb blast somewhere. I was so scared!" After a few days, she wrote in an e-mail to TIME, she began to relax. "I was still apprehensive, but less scared than the first day. I realized how friendly the locals are and that they are actually very honest and trustworthy people. After a few days I lost my initial fear and felt like I was in any normal city in Central Asia." In the end, she says there was not much to do in Kabul  partially a result of more than three decades of war  and she ended up visiting a few tourist sites nearby and hanging out with some foreign workers. "Kabul is generally pretty boring. There's not much to do. I was lucky to have met wonderful people, whom I had a lot of fun with. We spent many fun afternoons and evenings together, but if it wasn't for them, I'd be pretty bored I guess." Still, Bucinel's experience "outside the wire"  as NATO soldiers call leaving a secured compound  is more interaction with Afghanistan and its people than most foreign government employees, soldiers and many aid workers will ever have. Most will remain hidden and safe behind their blast walls and barbwire during their time in Afghanistan, impeding their ability to understand life in the country and to effectively aid its development. At the same time, it is hard to say what the benefit of Bucinel's experience is: since she is not in Afghanistan to work, is she simply a goodwill ambassador? Indeed, when an Indian couch surfer wrote on the Afghanistan Couch Surfing forum that "I want to come to Afghanistan and I want to see the war-affected areas. Which areas should I visit and what is the perfect time to come?" a storm of incredulous replies shouted him down, including one surfer who wrote, "I can't believe what I am reading ... traveling to war affected areas??? Do you think it's funny? Do you want to prove how brave you are? I think it's very disrespectful toward people who suffer under such conditions! Shame on you!" Couch surfers will have to begin questioning the wisdom of visiting Afghanistan as security worsens in parallel to the drawdown of U.S. and NATO troops that will be completed in 2014. But, for now, many will continue coming to pursue their own particular brand of tourism. "I guess the principle of couch surfing is the same wherever you go. It has to do with trust, and trust always, and everywhere, contains risk," says an Austrian hostess who spoke on condition of anonymity because her organization did not give her permission to speak. "And, if we finally give up on trust, then conflict, war and distrust have already won."